A state is called the coldest of all cold monsters. Coldly lieth it also; and this lie creepeth from its mouth: “I, the state, am the people.” … Where there is still a people, there the state is not understood, but hated as the evil eye, and as sin against laws and customs. One may question the effectiveness of protest, if protest is evaluated according to its success in overcoming or changing that which the protest is against. Protests against government policy which do little or nothing to alter it can therefore be judged as failures. But such a view is far too limited an appreciation of the significance of disobedience. Protest is ultimately rooted in indignation, in an ethical rejection of that which is suffered by others and oneself. And the act of protest, along with its consequences, is always radically unpredictable, and thus something that may always open up possibilities. Protest is life before injustice. In light of past protests and the arrogance of the State, it can be said that it is unlikely that the spanish government will take any notice of the event. As for the protest itself, and judging from the manifesto that sustained its organisation, one could criticise it for lack of political clarity, or inconsistency (with its call on government to change course, while also proclaiming the government’s illegitimacy; with its appeal to citizens to defend their rights, while calling for a new constituent process; the insistence on the need for a new constitution, while defending participatory democracy). And then there is the day after; what then? What follows the day of protest? (The effort to create a new camp, acampada dignidad Madrid, in the Puerta del Sol was quickly brought to an end by the police). Again, there is uncertainty. The virtue of the march lies in its keeping alive the indignation (an indignation does not not wane in spain, with 45,000 organised demonstrations in 2012 alone), in the organizers ability to mobilize vast numbers while bypassing official opposition political parties and labour unions (most notably, the Spanish Socialist Workers Party and the CCOO and the UGT unions), and the example the protest sets for future action. In the assemblies held after March 22, one of the possibilities raised was that of a general strike, but a strike understood as broadly as possible, again to be organized outside the framework of existing, official political agencies. The March of Indignation was initially called for by the marea ciudadana, one of the composites of the country’s diverse mareas movements, but was quickly embraced by a great variety of organizations and collectives, from 15M inspired assemblies and working groups, to radical labour unions (CNT, CGT, SAT, and others), from groups addressing homelessness, unemployment, discrimination, to older political organizations, including left-wing and regional political parties. The actors were many. And their flags marked their presence. But in so coming together, they lose a little of what distinguishes them, and offer a glimpse of, become, a people. 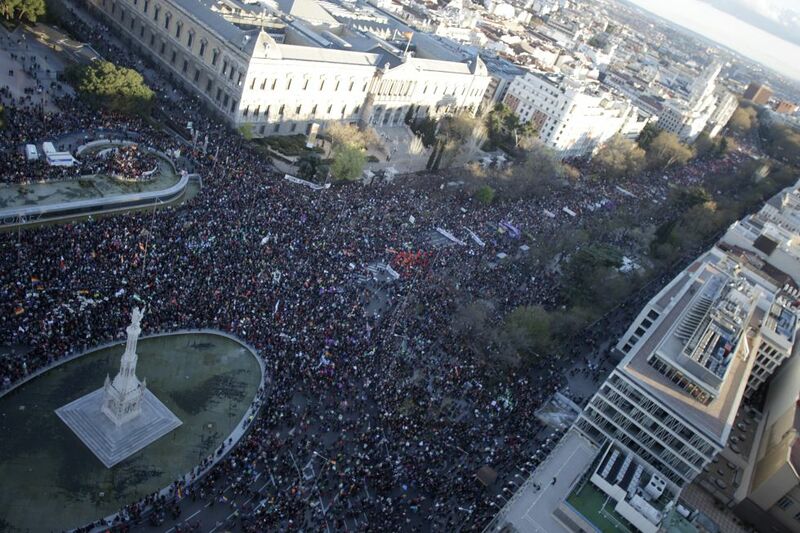 Madrid’s police could not of course absent themselves from such an event. Over two dozen people were arrested and many more would taste their violence. The lines of opposition deepen. As ever more expressions of dissidence are rendered illegal, or simply repressed, the lines of flight and resistance narrow and become more crispate. A challenge/dilemma thus appears: to engage frontally State violence with violence, or to continue to create outside the State, and defend the new possibilities created. This entry was posted in Commentary, News blog and tagged insurrection, rebellion, revolution, spain. Bookmark the permalink.